Did you have a fantastic Halloween? It’s my favorite time of the year, but somehow it snuck up on me this time. I was rushing around to carve my pumpkin late Sunday night, and thought to myself how I must be wasting the inside of my pumpkin each year. 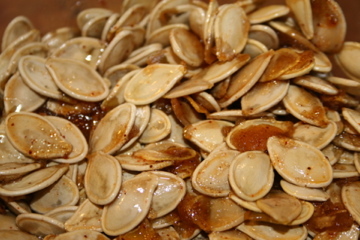 I did some research and found these 5 Mouth-Watering Pumpkin Seed Recipes from Slap Dash Mom. My pumpkin only had 1 cup of seeds in it, so I had to pick my favorite of the five. The barbeque version sounded the most unique, so I chose that one. Below is the recipe straight from Slap Dash Mom with pictures of my attempt at the seeds. I didn’t change anything because I was lazy and didn’t dry them properly like she said. This made the cooked seeds chewy. So the lesson is – follow instructions and don’t skip steps. 2. Bring 4 cups of water, pumpkin seeds, and salt to a boil. Simmer 10 minutes. Drain. 4. Mix seeds with olive oil and spread onto cookie sheet. 6. Toss seeds with the remaining ingredients. Roast an additional 5 minutes.